A few weeks back I had a great idea: I want to run a themed game for Halloween! Thus began a small project I’ve dubbed “Bump in the Night”. It’s a quick participation game I’m running for friends next Saturday. As a few of them have no experience with miniature gaming, I’m doing the game using the SoBH engine and its Fear and Faith mod. I haven’t abandoned my pirate project, as the Halloween game uses 18th century minis as well, so its two birds with one stone. The scenario is a tongue in cheek competition with monsters (a vampire, a werewolf, a zombie mob, a hellhound and the headless horseman) trying to cut down as many civilians as they can while the civilians try to make their way to the village church. It all takes place somewhere in New England, possibly. I have most of the minis I need for the scenario, but they need painting. First up are these innocent villagers. 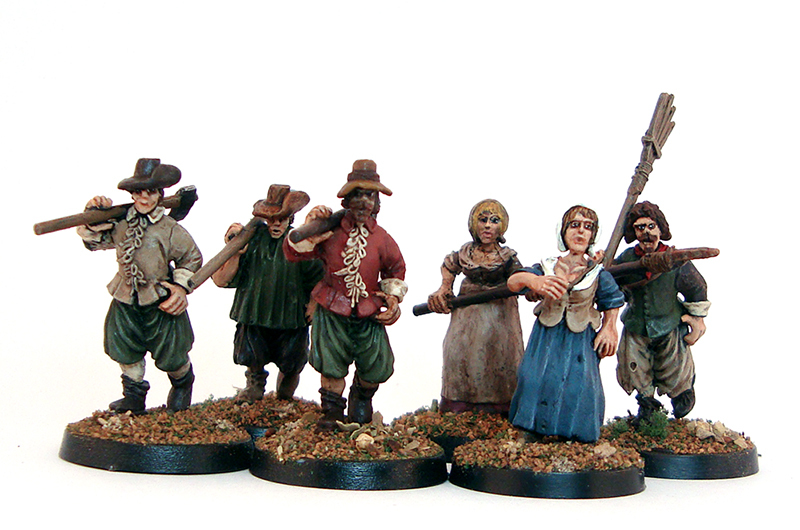 They’re actually English Civil War civilians by Redoubt Enterprises, so historically they’re off by a century or so. However…I don’t really care. I’ll just say it’s a really rural colony, and some of its people are very traditional. I originally bought the miniatures to add to my Warhammer Fantasy Empire army, and they’ve been sitting in the cupboard for ten years or so, I think. I was really happy to give them an airing and finally slap some paint on. They were pretty quick paintjobs, hence the groupshot that handily hides some mould lines and rough painting. I especially need to single out two minis, however, and they’re the disheveled lady in the back row and the red coated gentleman in the middle. Both were painted by my girlfriend, and they’re her first and third mini, respectively, with the first one painted a long while back. I based the minis with a mixture of green and brown flock, with assorted pizza herbs thrown in. I think they make for a nice autumn look, and are generic enough to be used in different settings. The minis themselves are actually quite nice, with separate weapons and heads on some. They’ll work nicely as village farmers and woodcutters not only in the Halloween game, but in fantasy and pirate games as well. I still have a bunch of 18th century miniatures to do, so better get to it. I’ll hopefully post new pics later in the week! Comments welcome, as always. The ones painted by me bring my painting count up to 24. Great idea! Please post photos of the game in-progress if you can. Sounds like a hoot. Marvellous idea, I’ve toyed with similar for a skirmish game but never got anywhere with it – I can’t wait to see more of your game. Great miniatures too from both you and your girlfriend, good work! Very nice job dude! I hope you can get some pics of the game, it sounds like great fun! Nice work on those Mikko. Painting civilians has an unusual, but definite appeal. They bring a game to life in a way that mores guys with guns do not. Thanks for the comments everyone! I’ll make sure to chart progress on this, with photos of the final game. Painting civilians really is nice, as sho3box said. I don’t know where it stems from, but it’s just immensely satisfying. Maybe it’s because they’re sort of useless gaming wise, and you’re painting just for fun?